Everyone agrees that halogen light bulbs are a thing of the past. They’re your normal filament lightbulbs like what we used in houses for a 100 years. 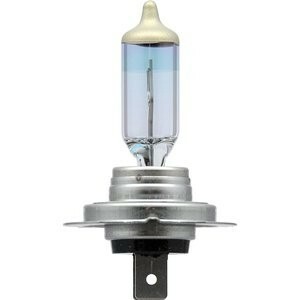 And most manufacturers still sell cars with halogen lights, as they’re cheaper than alternatives and get the job done. But they don’t compare at all to the brightness and illuminating power that a suitable high-intensity discharge (also known as HID or Xenon HID) light gives. HID headlights are also able to provide a much whiter light, which better mimics natural sunlight. This is as opposed to the warm, yellow colors typical of halogen lightbulbs. Online you’ll find a hundred reviews praising the performance of HID headlights. Over the past few years we’ve seen light-emitting diode (LED) technology develop to match, and in certain areas overtake HID lighting. LEDs that are used in car headlights make use of the same technological principle as the LEDs found in hundreds of other applications. Most notably you’ll find LEDs as notification lights in your cellphone, computer or even fridge. They are also well known from toys and as fairy- or Christmas lights. LEDs in this fashion are smaller, cheaper and draw a lot less power than alternatives. The biggest problem to date has been trying to replicate these traits in a product that is larger, and thus able to produce more light. Over the last decade you would have seen more and more torches and hobby lighting solutions making use of LEDs. And the transition is now well and truly making its way into automotive lighting. Although we’ve seen LEDs in third brake lights since the mid-90s, getting them bright enough to be used for car headlights has been a problem for a while. Audi and Lexus led the way in the late 2000s, using LEDs for headlights. But manufacturers have been slow to introduce them due to several technical limitations. The modding industry is often quick to take up the mantle in such situations, as in this case, but costs still remain high. And that’s where the Opt7 FluxBeam LED Headlight kit comes in. Opt7 have been producing lighting technology for cars since 2006, but have been involved in the lighting industry for over 20 years. Their first products were the base for their successful Blitz and Bolt series HID kits. All of which put them in the right space to produce some of the most reliable LED headlight kits and, in their own words, “pave the path towards a brighter road.” And to top it all off, they’re a US based company. The Opt7 LED kit is made to fit most cars, regardless of the previous lighting they had fitted. This can be a projection or reflection setup, and they have a range of fitment types that you can select to ensure the LED kit you receive fits first time. If you’re unsure, you can make use of Opt7’s compatibility check online. The LED kits even come in different options, depending on whether you’re replacing a single beam bulb, or a dual low/high beam bulb. The standard Opt7 LED bulb provides 4,200 lumens at 40W per bulb. And if fitted with dual beam bulb, the low beam outputs 3,500 lumens at 30W. That’s per lightbulb. Although this is not as high as some other products on the market, lower even than some halogen light bulbs, Opt7 are quick to point out that brightness isn’t everything. In their marketing, Opt7 claim their Arc-Glass Technology, in conjunction with the powerful CREE MK-R LED it uses, make it the only LED headlight that has the correct beam patterns. This results in a light that doesn’t have any dark spots, and ensures a beam that is not too short and that is linear in projection. And one has to take note of this. It doesn’t matter how bright a light is, if the light is not distributed in the correct way, it’s not going to illuminate what you want to see. What is certain is that the LED bulb emits a light with a color temperature of 6,000K. This results in a clear white light, with a slight blue tinge. Perfect for simulating natural light, while also adding a hint of style. Likewise, the CREE LEDs it uses are the current market leaders and made use of by multiple manufacturers. One of the big advantages of LED lights over halogen or HID lights is their lifespan. And the Opt7 LED bulbs are no exception, with an expected lifespan of over 50,000 hours. If you were to run them 24 hours a day, 7 days a week, they would keep on burning for 6 years. Considering normal usage patterns, you can expect these bulbs to keep on going long after the car has given up. The main way Opt7 can claim this of their LED bulbs, is their special cooling system. LEDs generate a lot of heat, and is the quickest reason for early failure. Opt7’s cooling system comprises of an aluminum heat sink that has a dual speed fan attached to it. Although the fan reaches speeds of up to 7,000RPM, you won’t notice any noise when the engine is running and you’re seated in the car. The entire LED kit is IP67 rated, which means complete dust and water protection. Opt7 goes so far as to submerge the unit to prove how effective the design is. All this is backed by a 2-year manufacturer’s warranty. When purchasing the Opt7 LED kit, you will receive a small box with the bulbs protected by a foam insert. In addition, you’ll receive an instruction manual showing you just how to install your new LED bulbs as well as a list of troubleshooting points. Opt7 have put a lot of effort into simplifying the installation, and their plug ‘n play claims are spot on. One needs only to remove the old light bulbs, install the LED bulbs and connect them with your car’s standard light bulb socket. And it works! The LED bulb is longer than a normal halogen bulb, with the heatsink and fan protruding a good inch at the back. This shouldn’t be a problem in most cars. The LED driver comes already wired into the assembly, but it is an extra bit of sealed electronics which just hangs in your engine bay. In certain cars you may be able to hide it away in the lighting fixture. It should be noted that a few customer reviews have complained that the orientation of the dual-bulb light is incorrect for their cars. This results in the high and low beams not functioning as they should. The workaround suggested by Opt7 is to loosen several screws on the base of the LED bulb, rotate it as required and then retighten the screws. This problem seems to affect only a small percentage of customers and the solution offered works for majority of those affected. After installation there is a chance that some flickering can be noted when running the lights. This is a problem Opt7 are aware of, and is most likely not due to a faulty unit, but just the setup of your car. If you do experience this flickering you can contact Opt7 and they’ll supply you with a free set of capacitor plugins. While it’s great that Opt7 offer this service to customers, it can be a bit frustrating. You only know about the problem once you’ve installed the lights. Then you have to wait an extra few days for the plugins to arrive. It would have been nice to see these included with the original package. Opt7 mention that a large number of mid to late model Toyota pickups experience certain operational issues when installing their LED kit. In addition, they warn that a majority of European vehicles, specifically those that utilize the H7 bulb-size have fitment issues. They advise those driving such vehicles to select a different set of LED headlights. Both of these issues are the types of problems which Opt7 can improve on. This ensures that future generations of their products do not experience the same problems. As with any product, the Opt7 LED kit’s reviews aren’t all 5 star. Bar a small minority of complaints about the light’s throw distance, and some units failing prematurely, feedback is amazingly positivity. The reviews praise the kit’s quick installation and impressive illuminating ability. But what of competitors. The LED headlight market is rapidly growing as more and more companies try to grab a piece of the pie. An Amazon search reveals a host of options. Many of them even look similar to the Opt7 offering. They are as bright, have fans to cool them and the source of their light also comes from Cree LEDs. There’s a Kensun LED kit that costs $30 less than the Opt7 kit and Mictuning offer their kit at only $50 for two LED bulbs. Now you need to decide. Do you go with a trusted name like Opt7, or do you risk it with a relatively new player like Mictuning? A company that, although they have received good reviews, don’t have the same background. It’s not an easy decision to make. As with all decisions one needs to decide how much risk one is willing to take. So… Should You Buy Them? 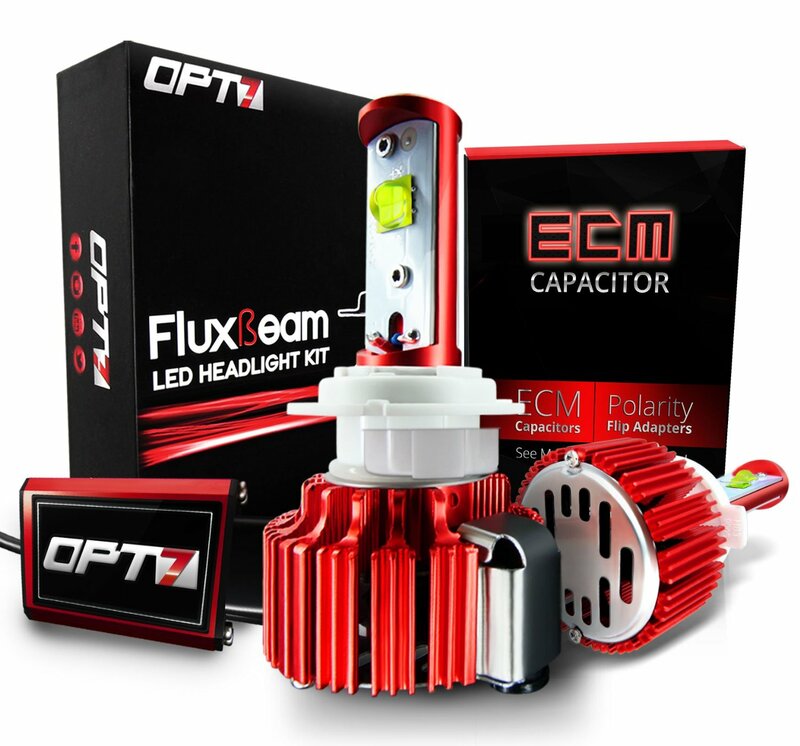 The Opt7 LED kit is for anyone who wants to improve the lighting of their car. LED lighting at the moment promises better illumination than halogen. It further guarantees better efficiency and a longer life than HID lights. You can even do it just to give your car a newer more modern look. It isn’t the cheapest product, but it is not expensive for what you get. And if you don’t want to risk this purchase on your headlights, you can test Opt7 out by trying another product from their line-up. They sell a set of LED fog lights for just $30. All in all, this LED kit offers good value for money, providing a high quality product sure to satisfy a variety of customers. And if they don’t fit, or have some other problem, a refund is only a request away. If $100 is too much for you though, I reckon you’d get by with the $50 Mictuning lights. Their specs are similar to those of the Opt7s at half the price, and their online reviews are as good as Opt7’s. Be warned though, Mictuning don’t have the same history and background as Opt7. They aren’t US based and support may take slightly longer. On a parting note, there is still quite a bit of discussion on the legality of LED lights being fitted to cars. This counts for the US and other nations. Obviously many manufacturers, like Audi and Mercedes-Benz, are offering new cars with LED headlights coming standard or as an option. You don’t need to worry about these. But when retrofitting a lighting solution to your car, you are taking a product that was certified, and changing it. All headlights in the US & Canada must adhere to the Society of Automotive Engineers (SAE) guidelines regardless of bulb type. They also have to be approved by the Department of Transport (DOT). Most other countries follow the UN’s Economic Commission for Europe (ECE) guidelines. Both of these organizations set standards on a number of specifications for headlights. Regardless of the specifications, approval is given to the combination of the mounting with a specific lightbulb type. People are in two minds about where LED lamps fall in this sense, and it seems even amongst law officials it is unclear. Some people have reported bad experiences with the police and receiving fines for installing LED lamps. Other people have passed roadworthy tests without hassle or any comment on their headlights. Majority of LED kits available online don’t specify their certifications. Some even stipulate that they are for off-road use only (thus negating any legislation). Whenever replacing light bulbs, you should always readjust your headlights, ensuring they aren’t shining too high. That is after all the biggest concern. It’s also the reason for so much legislation. An ill-fitting light can easily blind oncoming traffic. The nature of LED mounting is such that it shines only in one direction from its source. As opposed to a halogen lightbulb that shines in all directions. This, along with the combination of projection and reflection housings out there, make it difficult to predict exactly how well an LED replacement will work when retrofitting just the bulb. With the legalities as they are now, it’s a risk you’ll be taking regardless of which product you install.